The range of Canberra accommodation covers budget hotels to luxury apartments. Be close to the city's attractions and the snow fields of Perisher and Thredbo. BreakFree Capital Tower is located on the northern foreshore of Lake Burley Griffin and offers stunning views over the lake, the Brindabella Ranges and the city lights of Canberra. The hotel is located within five minutes of the CBD and within 10 mintues of the Canberra Airport. BreakFree Capital Tower offers guests a choice of 1, 2 & 3 Bedroom Apartments and 3 Bedroom Penthouses, each is self contained and has living and dining areas and full sized baths with showers. Facilities include a swimming pool, sauna, gym, squash court, tennis court and BBQ area. Crowne Plaza Canberra is one of the largest hotels in the region, boasting well appointed rooms with both Glebe Park and city views. This Canberra accommodation is ideally located in the heart of the Nation's Capital, within minutes walk of the CBD, the city's main shopping fair, many fine restaurants and bars, and national attractions. Accommodation at the Crowne Plaza Canberra is contemporary and modern in architecture and design, providing deluxe rooms and service excellence. With modern Art Deco designs, Hyatt Hotel Canberra combines 1920's charm with professional service. The hotel features a spacious Tea Lounge area, opening out onto outdoor courtyard areas, and an onsite restaurant. This Canberra accommodation has a fully equipped fitness centre, indoor pool, spa and sauna. Mantra On Northbourne is centrally located on the north side of Canberra's CBD, a short walk from the city's thriving shopping and dining precinct, business centre and a vast array of famous attractions. This Canberra accommodation offers guests hotel rooms and apartments. Facilities include an indoor heated swimming pool, fully equipped gymnasium and restaurant and bar. Peppers Gallery Hotel is a luxury boutique hotel located next to Lake Burley Griffin, a short distance from the airport and Canberra's key cultural, entertainment, sport and commercial facilities. The hotel offers guests a choice of rooms, suites and apartments. Facilities include an onsite restaurant, 24-hour reception and fully equipped gymnasium and. QT Canberra offers guests a CBD location while being directly next to Lake Burley Griffin. The hotel features views of the lake, surrounding mountains and city area. 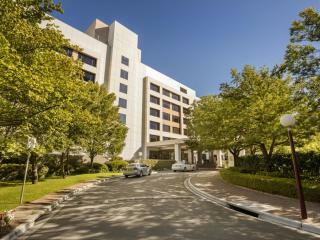 With this great location it makes QT Canberra ideal for both business and leisure travellers. This Canberra accommodation features luxury design rooms and a range of restaurants to choose from. The Novotel Canberra is ideally located in the centre of Canberra. With a selection of rooms and facilities including meeting rooms and a business centre, this Canberra Hotel is ideal for business or pleasure. Relax with a drink in the bar, or enjoy a meal in the restaurant. Parking is also available for your convenience.